This weekly organizer is a convenient & compact storage system made of durable high-quality canvas. It includes 7 pill boxes with the first letter of the respective day of the week clearly imprinted on the front of each one. Each Pillbox has a capacity of 14 aspirin-sized tablets. 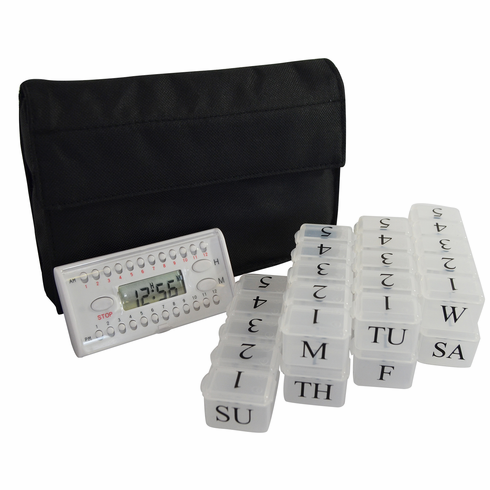 This set also includes our popular Easy-to-Set e-pill Multi-Alarm Timer. The timer allows the patient to set up to 6 Daily Alarms that automatically reset every day. The alarms can be set every hour, on the hour. No need to Reset Alarms on Timer - Repeat every day. 5 (five) Doses per Day Pill Box. One for each day of the week. Each Pill Compartment (five per day) holds up to 14 aspirin sized pills. Great for Home, Office, School, or Travel. Discrete black travel canvas case with Velcro lock. Capacity: Holds 14 Aspirin sized tablets per Dose. Battery life: 3-4 Months. One CR 2032 Battery Included.